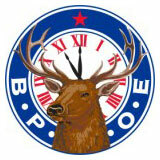 “Hoop Shoot” is the largest and most visible of the many youth activities sponsored by the Elks Lodges. Millions of participants and their families will be involved in any year’s competition nationwide. From its beginning as a Corvallis, Oregon Elks Lodge youth activities project in 1946, the Elks National Free Throw Contest (“Hoop Shoot”) has grown to be the largest coeducational youth athletic program in the United States of America. The Elks “Hoop Shoot” is another highlight of the way the Benevolent and Protective Order of Elks exemplify the motto ELKS-Investing in the Future. It serves as an example of our Order’s full commitment to the youth of our nation. The general aim of the Washington State “Hoop Shoot” program is to extend to all girls and boys in the State of Washington , ages 8-13, an opportunity to participate in the Elks National “Hoop Shoot” Program by conducting professionally run contests at the Lodge (local), District and State levels of competition. Contact your local lodge for more information.